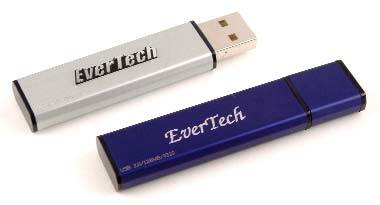 OS/2 and USB Web Site: USB Mass Storage Devices (Removable Devices). Comments According to the OS/2 Device Driver Pak On-Line this USB Device should work without any problem under OS/2. OS/2 CHL testing team have tested this device thoroughly, and confirmed complete functionality. Comments This device was tested by OS/2 CHL hardware testing team. It worked perfectly on MCP2, eCS 1.1 and with IBM's latest USB floppy drivers (also called usbmsd drivers). Comments The device works finde under OS/2 with the lastest IBM USB Basic and Storage Drivers. Comments OS/2 CHL hardware testing team has successfully tested this device with MCP2 and eCS1.1 by UPDATING USB MSD device drivers (IBM official build) to the latest version. 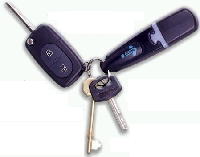 Driver can be downloaded with valid SWC login on DDP OnLine via the entry USB Memory Key device driver. USB 1.1 peripheral. Very handy small device. Designer Mycom / Apacer Inc. Comments This device was tested by OS/2 CHL hardware testing team using IBM's official latest USB MSD device drivers and CW-USB drivers v1.2. Comments Peter Jesper tried this device with the latest USB Mass Storage Device driver. All that normally is needed is: "LVM /ReDiscoverPRM". But sometimes a ghost removable drive appears, on a PC without USB CD-ROM, and USB-floppy and with only the HandyDrive as removable... Solution: update the appropriate lines in config.sys with these lines: BASEDEV=USBMSD.ADD /FLOPPIES:0 /REMOVABLES:1and REM out the USBCDROM.ADD statement. A VFAT driver will enable the long filenames, otherwise you only get the 8 + 3 (FAT16) file access. And of course "Eject Disk" will disconnect the drive, disconnecting and then reconnecting the unit physical will make it reappear as a removable drive in the drive-list. Comments Nicholas Lysaght let us know that he got this device working under eCs V1.1, with the latest USB Drivers from the eCs Homepage. - This is a USB 2.0 compliant mass storage device. - It works backward compatible with USB 1.1. - It has 4 independant card slots. I have used 3 simultaneously and it works completely under eCS 1.0. 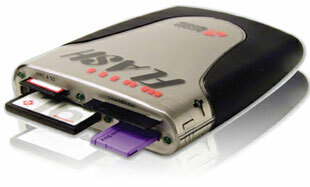 - The drive works both as an external and internal drive even under OS/2. 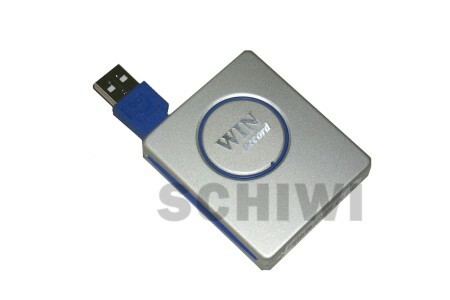 - It work with both USB 1.1 and USB 2.0 ports under OS/2. - It works with the latest USB device drivers (10.145). - It also worked with older drivers but I don't remember which version. - Works with EHCI, OHCI and UHCI drivers. Comments Geert Stevens told us this device driver works fine under eComStation 1.1 with FixPack 4. Comments Laurent Catinaud told us that this device eCS 1.1. 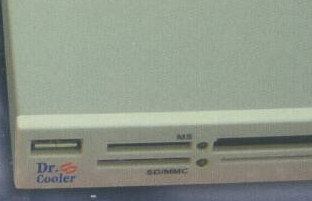 This is an IDE DVD reader/CDRW burner that includes an USB 7 formats memory card reader. The card reader is reported as \"IOI Mediabay\", so I suppose you can also find this one alone. He didn't test it with other cards but its probable that other storage cards will work. Comments Willam Nau sent us comments about this device. He's running the eCS 1.03 USB drivers. Plugged in the devices and it was fully functional immediately. Designer Carry Computer Engineering Corp. Ltd. Comments OS/2 CHL hardware testing team has successfully tested this device using IBM's latest USB MSD device driver. Comments Chris Clayton reported this device to work correctly. Works very well with the newest IBM USB removable media driver. Also doesn't work with the CW-USB drivers. He was able to repartition the disk and format it with HPFS file system. As delivered, the disks are FAT16 formatted and thus limited to 2GB. 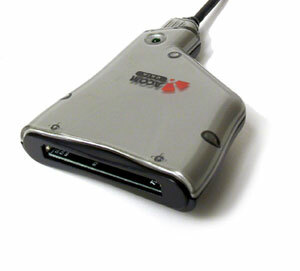 The drive actually has a SCSI-II interface and uses a SCSI-to-USB adapter. The USB Resource monitor reports it as Vendor: Shuttle Technology, Product: eUSCSI SCSI bridge. Sysbench indicates that the average transfer rate is 625KBps. A useful, but pricey backup option. Comments David Shearer told us this device works on ecomstation 1.2R. 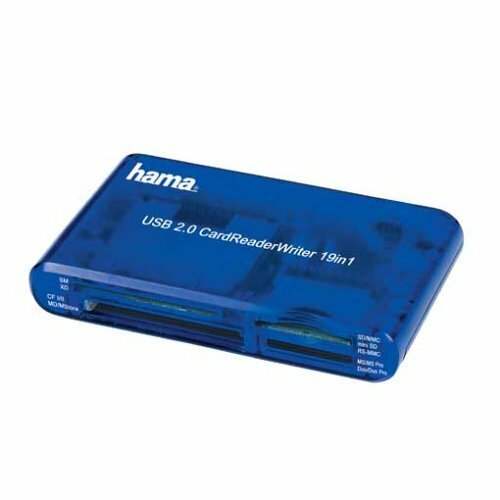 Contains a USB 2.0 to IDE adapter with built in 3.5inch and 2.5inch pin plugs to suit normal IDE and laptop IDE pin sizes. It works with a CD ROM and laptop hard drive. 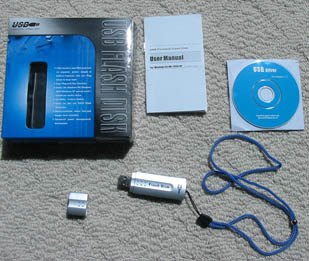 The box contains a separate power supply to power the CD ROm or hard drive. You must enable the USBCDROM.ADD entry in your config.sys. Comments Stefan Zigulec told us this device works fine under eComStation 1.1. Comments OS/2 CHL has successfully tested this device using IBM's latest USB MSD device drivers. Supported on MCP2, eCS 1.1. Comments Geert Stevens get this device working under eComStation 1.1 with Base Driver Fixpack 3.It was tested with Smartmedia 8MB and 64MB and reading /writing and formatting works ok. Comments Hilsen Per Lok Larsen told me It works fine with both IBM's USBMSD and CWUSBMSD 1.2b driver on MCP2. Comments According to Sedlmayr Hanno this device works fine under OS/2. Comments Derek Wright tried this storage device with success under OS/2. Comments OS/2 CHL hardware testing team has successfully tested this device using IBM's latest USB MSD device drivers, downloadable via OS/2 DDP OnLine using active SWC subscription. MCP2 and eCS 1.1 do NOT support this product out-of-the-box: driver updating is required. Comments Installed Asus P4P800SE, Dawicontrol DC-2974 PCI, Realtek 8139 based NIC (Sitecom card), Dr Cooler DCRU2-D43 card reader, Matrox G400 videocard. With this I can use my Dr Cooler DCRU2-D43 card reader. USBMOUNTD won't notice if you plugged a card in or out. You have to do it with the command "lvm /RediscoverPRM". 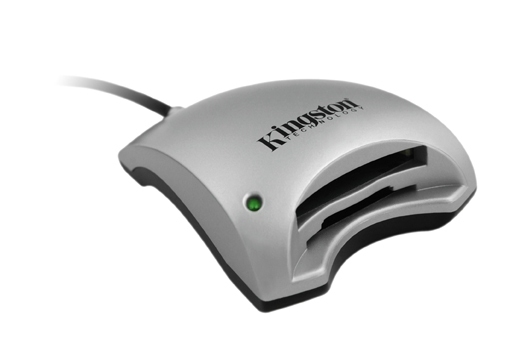 The reader is mounted on USB port 5 and 6. In USB Device monitor it present itself as Genesys Logic, inc. with the next information. Technical information is provided here. Thanks to Joop Nijenhuis for this very nice information, and his very constructive feedback (Sorry we kept you waiting so long)! Comments Alex Samorukov has this device (the 64 MB version) and works great under OS/2. Possibly other models with more capacity works well under OS/2 or eCS. Vendor ID: 0x1065, product ID: 0x2136. Successfully tested with CWUSBMSD.ADD V1.1 or higher. Comments Tested with: MCP 2, kernel Revision 14.086, Danis' IDE Driver/Atapi Filter (1.4.7/0.3.9), FAT32 Driver, ABit KT7A with a UHCI USB Controller. Need CW-USB drivers to get it working. 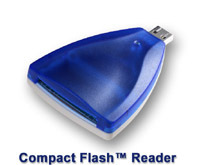 Remark: If I do not have the flash card already inserted into the reader, it will never be recognized by OS/2. Also, if I eject the media to remove the flash card and re-insert it, the card is no longer recognized. I can, however, eject the media and unplug the whole device out of the USB port (with the card still in the reader)... plug it back in (with the card in the reader) and it will work. It seems as if it doesn't like it when I don't have the flash card already in the reader when I plug the reader into the USB port. Comments Daniel Kruger reported that this device works fine under OS/2. It was tested with Warp 4 and CWUSBMSD.ADD 1.2b. Comments Christian Proehl is happy to report this device to work fine with the latest USB device drivers on eCS 1.1. 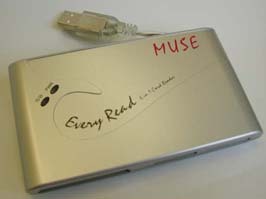 The device is also available with 128 and 512MB versions, and these are espected to work fine, too. He used it successfully on an ASUS A7V333 mainboard (VT6202,VT8233A chips). For getting FAT32 working he had to repartition the flash device (Using 0b partition ID). Originally the device was VFAT formatted. The FAT32 formatting was done with Win2000 (on a Thinkpad). A USB Resource Manager output can be found here. 4. Use 'Eject Disk' from this icon's context menu to change or remove the medium. Remark that it seems that this procedure only works if the device is not plugged during boot. Thanks to Mike Maksimik and Aigner Manfred for this information. Comments Jan Dinger told us this device works under ecs 1.2 R. He puts this Image memory card reader (Price ~16 €) in an USB-Slot of an running OS/2 System (ecs 1.2R ). 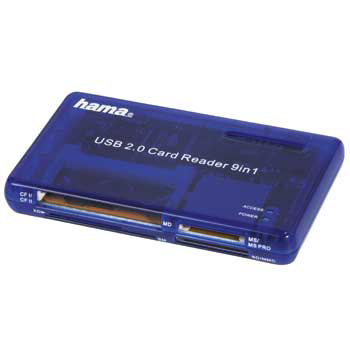 The cf2 Card ( 32 MB) from HAMA was recognized directly. He could write and read the card. Comments Gay Guillaume reports us that this device works under OS/2 Warp 4. Designer Hagiwara Sys-Com Co., Ltd. Comments OS/2 CHL hardware testing team has successfully tested this device using IBM's latest USB MSD device drivers, downloadable via OS/2 DDP OnLine using active SWC subscription. MCP2 and eCS 1.1 support this product out-of-the-box. Comments Eischer Gerald told us this device works fine under eCS 1.0 (FP4). Works fine with USBMSD.ADD Rev. 10.135. He only tested the CF-Card and SD-Card. Comments Chr. Proehl report that this device works under eComStation 1.1. 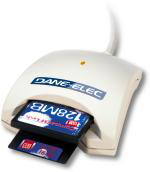 EAN Code: 4007249397386 P/N : 00039738 External card reader for SecureDigital Cards (SD, SD Ultra, SD Extreme, Trans Flash) and Multimedia Cards (MMC, MMC plus, RS-MMC, MMC 4.0). Tested with SD-Card (provided with Canon digital camera) attached to a USB 2.0 hub device. Comments Ralph-Guenter Bruns told us this device works fine with eComStation 1.1. 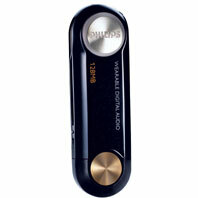 - Supports Smart Media, XD, CF I&II, Micro Drive, Memory Stick, Memory Stick Pro Memory Stick Pro Duo, SD. 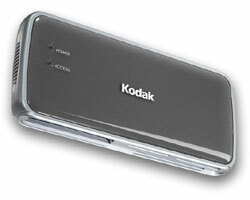 - If not inserted at boot time Memory Cards are recognized as removable drives and inserted and ejected. Comments Lars Egeberg Hansen tried this device under OS/2. He tried it with a 16 MB and a 512 MB Compact Flash and a 256 MB Secure Digital RAM. All three cards worked fine both reading and writing. He is using Warp 4 with FP 17 and the latest USB drivers from IBM (30/6/2004), with the MSD driver build nr. 10.135. Comments Mark B. Szkolnicki has tested the 8 MB IBM Memory Key and works fine reading and writing files to it. Quinque reported the 32 MB also works fine under eCS. Its very possible that other with higher storage capacity also works under OS/2 and eCS. Comments OS/2 CHL hardware testing team has successfully tested this device with CP1, CP2, eCS 1.1 and IBM's latest USB MSD device driver. "I tested the Imation FlashGO! 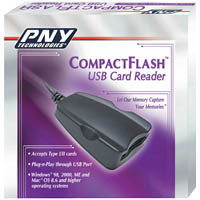 Flash Memory Reader Writer, which is a portable device that can read/write CompactFlash cards I & II directly, and can be used to read/write from and to SmartMedia cards, Memory Sticks, MultiMediaCards, Secure Digital cards and IBM MicroDrive, using 3 slip-in adapters which come with the FlashGO! package. I tested the FlashGO! with a 256 MB CompactFlash card and an 8 MB SmartMedia Card (using the appropriate drive letter). I was able to successfully read and write from and to both cards, using the latest IBM USB DDPak 3 and IBM MSD drivers. I do not currently have MemoryStick, MultiMediaCard, Secure Digital Cards or IBM MicroDrives, so these have not currently been tested." Some comments from Dan Kozisek: "It reads Sony Memory Stick media just fine. I have not tried to write to it, but the way the product works (adapter inserts with a universal interface) I have no doubt it reads/writes all supported formats under OS/2." Comments Paul Williams told us this device works with OS/2 Warp Server for e-Business with CP2. He used it with the latest IBM USB Basic Device Driver Support version 10.123 and the latest IBM USB Mass Storage Device Support (USB-Removable Media and CDROM Devices)version 10.135 and worked first time. Comments Roberto Gainza sent me a tip tp make this HDD work under OS/2. Check it out!! Comments According to Mike Maksimik: "Works like a charm. I formatted the disks using HPFS and I run an autocheck when the system boots up. I also use 'Refresh Removable Media' which is part of MCP to refresh the drive icon. I have noticed that if I boot the system up with the drive not attached, then if I plug the device in, the system detects the drive and assigns it a drive letter without failure." Comments Roberto Gainza told me this device works fine under OS/2 with 750, 200 and 100 zip disks . 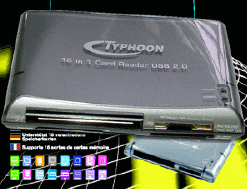 Comments The fotoshow is a variation of the iomega zip drive. It works without any problem under OS/2 using the USB port. Thanks to Peter Kells to let us know that. Comments CW-USB drivers. Needs the parameter /FIXED_DISK in config.sys. USBRES device report available here. USBRES device report available here. Comments This is a combination USB memory stick and SecureDigital/MultimediaCard Reader. Both the USB memory and the MMC card reader work great under eCS. Plug in the USB stick, it shows up as a removable drive. 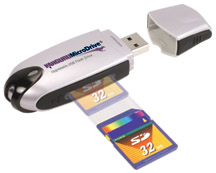 Plug a MMC card into the USB stick, the MMC card shows up as an additional removable drive. Comments OS/2 CHL hardware testing team has successfully tested this device on MCP2 and eCS 1.1. Comments Wolfgang Rapp told us this device works fine with OS/2 Warp 4 Fix Packs: FP15, DD03, TCPIP4.3. He Bought it from Newegg.com, Item# N82E16820155209, 23.50$ and is working flawless so far with USB drivers buildlevel 10.135+. Doesn\'t have a cap, but instead has USB connector retractable into housing. Comments Delfi Reinoso told us this device works plugged on a ECS 1.2 system, without modifications after installation, the full extent of the SD card is recognised as a removable device. Loaded Chris\'s USB MSD the unit works too. It\'s a USB 1.1 device, but 2.0 units are on the way. The best thing: the memory available depends of the SD/MM card, or cards. Going for a 1 GiB, that I can share with the Digital Camera. Comments Bart Bremmers reports that this reader works out of the box with eCS20beta2. 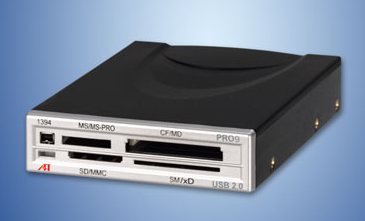 It reads CompactFlash, Memory Stick, Microdrive, MultiMediaCard, SecureDigital and SmartMedia. It readsmicroSD via an SD adapter. His microSD (transflash) memory uses FAT16, so FAT32 driver is not required. He doesn\'t know if the other media types will require the FAT32 driver. Comments Julian Thomas reported this device works fine with the CWUSB drivers with CD cards. It also works with eCS 1.2 and the latest USB drivers downloaded from the ecomstation site. 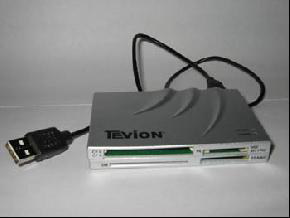 Comments OS/2 CHL hardware testing team has successfully tested this device on CP2, eCS 1.1 and with the latest IBM MSD device drivers, available via OS/2 DDP OnLine using an active SWC account. Comments Doug Bissetttold us this device works fine under OS/2. 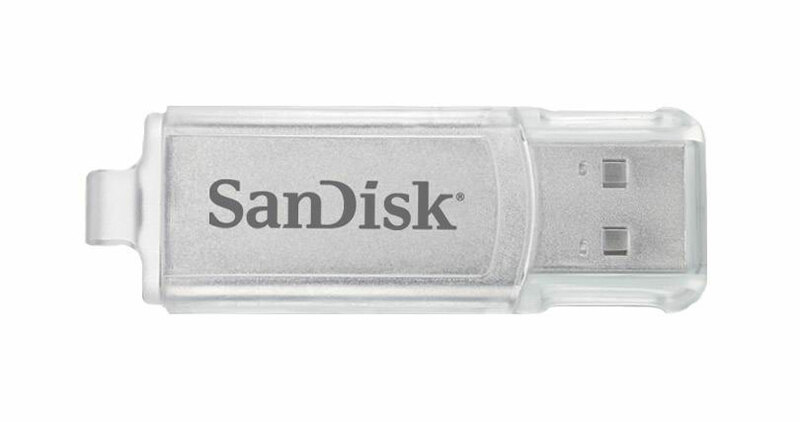 This device is the same as a normal "thumb drive", but it has no memory of it's own. It can use MMC, SD, or Memory Stick memory (one at a time). He has 3 SD memory units (32 meg, 128 meg, and 256 meg), and they all work. I use the SD memory in my HP Photosmart 935 camera, and he can simply put that into the Jumpdrive unit, and transfer the data, without needing to burn battery power in my camera. He had formatted it as FAT, and HPFS, although HPFS is not useful, except with OS/2 systems. Comments Yuri Dario told us this device works fine under eComStation 1.1 with fp4 with the USB Storage Driver USBMSD 10.135. It was tested with Lexar media 1GB CF card (fat formatted). Designer Transcontinenta / Lexar Computer Peripherals Inc.
David Chacona also reports that the 128MB version works fine with eCS 1.1. Comments Julian Thomas told us that this device works fine with ecs 1. It Works perfectly with eCS 1.2 and the latest (late 2004) USB drivers on both CF and SD cards. Comments Darrell Spice reported that this storage device works great under OS/2. Comments This device was tested by OS/2 CHL hardware testing team and worked correctly with IBM's latest USB MSD device drivers available via OS/2 DDP OnLine via active SWC account. Without the /FORCE_TO_REMOVABLE, the drive would not register in the system. Comments Jose J. Refugio Rodriguez told us this device works on OS/2 Warp Server for e-Business with fixpacks xr_e003 and xr_d002. Note that the switches (or options specified by the forward slash) denote a couple of removable mass devices corresponding to my two (2) USB ports in my IBM T40. Comments Chris Hodgkins told us this device works fine as a storage device under ecs 1.0 with fixpacks XR0C004 XR0D003 WR08708 IP08605 UN02334. Comments Franklin Bartczak told us this device works under eCS 1.1 (FP3). Designer Mitsumi Electronics Corp Ltd. Comments This device was tested and approved by OS/2 CHL hardware testing team. Code: 2. Comments A Smart Storage Mobile HDD USB 2.0 Case. Ed Durranttold us this device works fine under OS/2 (MCP2 and ACP2) with Fixpack 4 and with eCS 1.1. 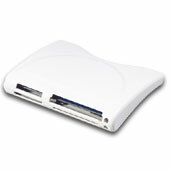 This is an external USB 2.0 3.5 inch harddisk case (self assembly - add your own 3.5 inch EIDE PATA harddisk). 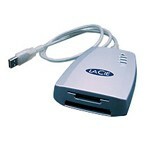 operation requires current USB drivers - as per supplied with eComStation 1.2. This box cost AU$55.00. Can be connected to USB 1.1 ports on system. Comments Wolfgang told us that this devices works fine with eComStation. Comments This device was tested by OS/2 CHL hardware testing team and was found fully compatible with CP2 and eCS 1.1. Comments Chris Hellwig reports that this device works as an storage device with CW-MSD and VFAT Driver. Speed seems to be low, but after writing one can remove the stick, with Windows it takes minutes for 'eject'. Comments Kresimir Buben told me It works fine without with the IBM Storage driver and no special trick was needed. Comments According to Mark Dodel, this device works fine on his Dual Pentium Pro workstation. Comments Steve Duvall told us this device works fine under OS/2. OS/2 CHL hardware testing team tested the 64MB variant of this device and concluded its full enablement with IBM's USB MSD latest device drivers, available via DDP OnLine under the section "USB memory keys". Need valid/active SWC account to download though. 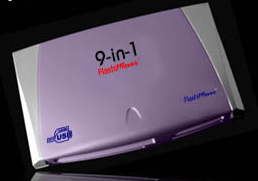 Comments The PQI 5 in 1 travel flash card reader works fine with eComStation using the basic USB drivers and CW USB Mass Storage drivers. USBRES device report available from here. Comments Dan Leitner told us this device works fine with OS/2 Warp 4 FP14 and the CW-USB Mass Storage Class driver kit v1.2. Read and Write works correctly, but the device will only mount if connected on boot (No LVM here). Tested with 16 MB and 64 MB cards, but doesn't work with an old 4 MB card. It's a well-made device that includes an extention cable that makes connecting to rear USB ports easy. Comments OS/2 CHL hardware testing team tested this device and concluded its full enablement using IBM's official latest USB MSD device driver, available from DDP OnLine with active SWC / PassPort Advantage account. Comments OS/2 CHL hardware testing team has tested this device and found it fully functional with IBM's latest USB MSD device drivers, available via OS/2 DDP OnLine via valid SWC or PPA subscription. Comments OS/2 CHL hardware testing team has tested this device and found it to be fully functional with CP2, eCS 1.1 and IBM's latest usbfloppy.exe device driver. Comments Jim Marshall told us this device works fine with eComStation 1.1. Reads CF 512 memory card perfectly. Have not tried anything else. Good solution for my Canon SuperShot S500 Digital ELPH camera, which is PTP, not a mass storage device. Need to Refresh Removable Media first. Comments Robert Fuchs reports that this device works on OS/2. Remarks: - USB 2.0 Flash Drive. - USB support was at level 10.145, 10.123. 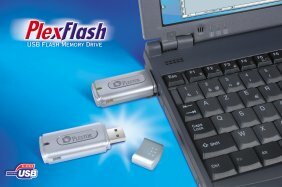 - The USB Flash Drive works without parameters in the config.sys. Comments Andrej Gava told us this device works fine on eComStation 1.1. Comments Dr. David E. Sawyer reports that this devices works great with eCS 1.1 and the the IBM USB 10.123 drivers. Nicky Avery also told us this device works fine with OS/2 Warp 4 with Fix Pack 11. Comments David Sheared reported that the compact flash card works fine. "You can read (but not write) to the CF card using the standard IBM MSD drivers - and using Chris W's latest efforts you can also write to the CD card. The latest IBM USB basic driver is better than the one Chris provides which unfortunately causes a delay in reading and writing from and to the CD card." USBRES device report available here. Comments Derek Wright tested this compact flash card reader with OS/2 and succeeded transferring the files from the flash card to OS/2. Comments Matt Berman reports that the Sandisk Mini Cruzer 256MB USB flash drive works great with IBM's Oct. 2003 USBMSD driver. It is an excellent inexpensive option for OS/2 users. Comments Michel Goyette told us this device works fine with OS/2 Warp 4 with Fixpack 15. Comments Small MP3-player to be used with Siemens cell phones and some Siemens Gigaset cordless phones (Gigaset Micro). 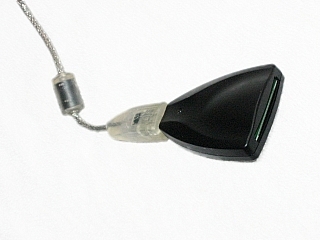 The mobile is used for display and power supply. It uses MultiMedia cards (MMC) for storing the MP3s and may also be used as an external memory device for carrying any kind of files. File system is VFAT. No DRM or similar crap. Comments Gerald Eischer told us this device works fine under eComStation 1.0 with Fix Packs XRGC004 It works fine with USBMSD.ADD Rev. 10.135 at an USB 1.1 port. Didn\'t work for him with newer Versions of USBMSD.ADD. He had the same problem at an USB stick which has a chip from Alcor Micro too. Comments OS/2 CHL hardware testing team has tested this device and found it to be fully functional with IBM's latest USB MSD device drivers. Comments Henk Pol wrote us to tell this device works fine with eCS 1.1. He uses the USB Mass Storage Driver without any problem. Comments OS/2 CHL hardware testing team has successfully tested these devices with the built-in USB drivers of MCP2 and eCS 1.1 preview. Comments CWUSBMSD.ADD V1.2 or higher needed. Comments Works fine with CW-USB drivers. He also tried with the "CW Mass Storage 1.2" driver but the system hangs during boot (HDD not attached!). Guess there is some compatibility issue with the latest IBM USB Base Drivers. On the other hand they seem to have cured other problems for some users. The HDD has a built-in USB 2.0 hub with 3 ports. It works fine with the card reader I reported earlier (Typhoon USB 2.0 16-in-1 Card Reader). Comments Heiko Nitzsche tested this device under OS/2 without any major problem. It was tested with different CF cards up to 1GB with FAT16 filesystem. He couldn't test other slots because he was missing this cards. 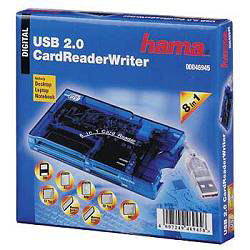 Read and write works with USB 2.0 Highspeed level. This device has been tested with the following USB driver revisions: IBM's USB base : 10.145 IBM's USB mass storage: 10.145 CW's USB mass storage: 1.2b After plugging in the card reader, double click "Refresh Removable Media", after which a new storage device object will appear in the drives folder if a memory card is in one of the slots. This object gives access to the files on the memory card. Hotplugging the card (eject drive, remove card, enter a new one and refresh drives) works too. I was only able to test with Compact Flash card slot and a 1GB SanDisk Ultra II CF card because of lack of other card types. 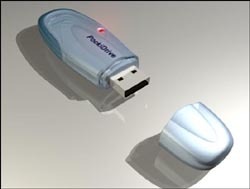 Comments Duane Chamblee tested this USB device with complete success using the latest USB Storage driver (USBMSD Oct-15-2002). This device can have different capacities. The sizes available are 16MB / 32MB / 64MB / 128MB / 256MB / 512MB / 1GB. Product USB external HDD case for 2,5"
Comments Hilsen Per Lok Larsen told me It works fine only with the CWUSBMSD 1.2b driver on MCP2. USBRES device report available . Comments Philhard Ackermann told us that this device works fine under eCS 1.0 with FP1 and FP2. Comments Peter Verweij reported this device to work fine. 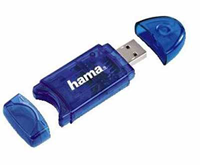 Click here for a USB Resource Manager output. Comments OS/2 CHL hardware testing team has tested this device and confirms it is compatible with IBM's latest USB MSD and usbfloppy.exe device drivers. 240 models have a built-in technology that allows 32MB of data to be written on traditional1.44MB floppies, but we weren't able to use this technology on our OS/2 testing systems. Comments Delfi Reinoso told us this device works plugged on a ECS 1.2 system, without modifications after installation, only 37 Gib can be seen even by DFSEE. Loaded on a XP original system (is a new notebook) He can format a 114 GiB partition with NTFS and rebooting ECS al data can be seen. So asking on the hardware list, I have understood that the problem is on the IBM USB Mass Storage Device. The settings are the same than those listed for a Maxtor 120 GiB unit listed on http://www.os2warp.be. Loaded Chris\'s USB MSD driver, he can see allldisk capacity, DFSEE also, and LVM it\'s able to set partitions and volumes. The USB Basic driver used on the successful test was IBM\'s. Comments OS/2 CHL hardware testing team has tested this device and confirms it is compatible with IBM's latest USB MSD device drivers. Comments OS/2 CHL hardware testing team has tested this device and concluded it to be fully functional with CP2, eCS 1.1 and IBM's latest official usbfloppy.exe.